The cusp of a new platform is a dangerous place to be in. In my world, it usually it means that we’re looking to upgrade or replace our EPM platform and therefore are scaling down our investment in it until we can make the great leap forward. The problem is, of course, that our processes don’t stop evolving. They keep changing and moving. Once an organization determines it’s on the cusp, it’s more likely to have a process/tool mismatch, where the two get out of synch. That then results in a drop of user adoption, a lack of process controls, and a gradual descent into the same chaos the organization started from. Being on the cusp hurts organizational performance. Enter the cloud. Being in the cloud means that the organization will never really have to worry about big bang upgrades again. Instead, the focus can move from the technical to ensuring the evolving processes are supported by the tools. This tends to change the long term support discussion. Instead of planning every several years to reset the tools to match the processes, organizations in the cloud move to a more constant, steady stream of tool changes that ensure compliance. This, I suspect, will be one of the bigger changes of moving to the cloud….the change in thinking towards IT that comes from not having that periodic opportunity to remove the old and start with the new, that opportunity to get rid of the old architecture and move towards a brand new one. “….the primary and secondary purpose of the [schedule] must be to promote the project. A tertiary purpose to support cost control, facilities management, or home office concerns should be acceptable as long as such do not detract from the primary purpose. 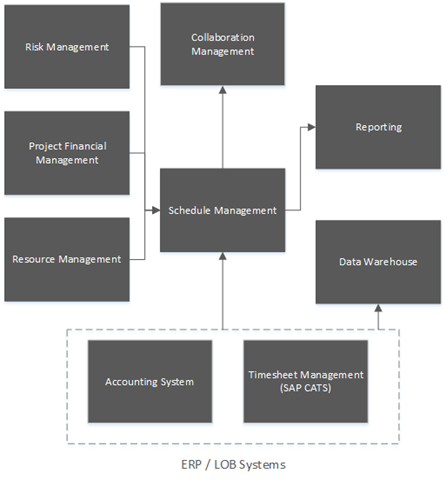 First off, I’ll emphasize that Enterprise Project Management (EPM) is a rather broad term encompassing many of the capabilities required to deliver projects effectively: portfolio optimization, business case development, business architecture, etc. 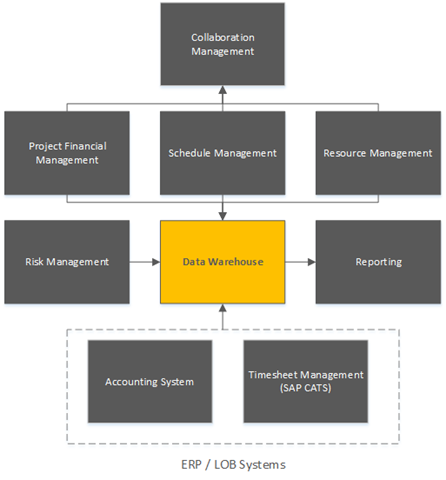 In this case, we are focusing on a subset of these capabilities, specifically the field of enterprise scheduling. Organizations with low scheduling maturity that are both trying to enhance maturity and enhance visibility into their project schedules. Organizations with high scheduling maturity that are only trying to enhance visibility into their project schedules, i.e. the “dashboard” scenario. I would say that outside of simple question of visibility, most of the organizations I’ve worked with that fall into the latter category are also dealing with issues related to the ongoing “Great Shift Change,” where many of the schedulers who have highly mature (albeit unconsciously competent) processes are retiring, and enterprise scheduling is seen as a way of capturing their knowledge in the form of process and templates so that it may be passed on to the next generation of schedulers. Visibility into the actual dates of the deliverables within the schedule. When will we hit key milestones? When will the pipeline be ready to transport gas? When will various crews be required to roll in and complete their work? What are the risks that critical activities will get pushed into deer season and thus have to be delayed to ensure none of our personnel get shot accidentally? Visibility into the quality of the schedule. How well are our schedulers following the basic precepts of solid CPM scheduling? Do all tasks have predecessors and successors? Are resource assignments correctly set? Are constraints used correctly? As annoying as they may be, the latter set of criteria are what’s important in driving up scheduling maturity. They provide the reinforcement metrics required to take a group of engineers with limited scheduling experience and drive them up the maturity curve – which is most often what is called for when an organization decides to embark on an EPM journey. So how do we avoid the dead end low-value result of having a bunch of simple reporting schedules? Through education of the actual folks doing the scheduling. Through emphasis of the right metrics. Through the use of the correct information in driving the day to day decisions required to manage complex programs and portfolios of projects. Most importantly, perhaps, through not skimping on the level of effort required to train and support these schedulers (and their bosses) as they make a mental leap from project managers who do some scheduling to actual bona fide schedulers. One of the fun things about my job is that often I find myself knitting together multiple disparate systems and scheduling philosophies. In this case, I’m working with a client on a field scheduling problem and we’re identifying how the multiple constituencies within the organization can collaborate to deliver a high level of service to the customer base – while at the same time ensuring an appropriate level of cost. From a very macro level, we are now trying to solve an equation for two optima…..how do I deliver world class service to a customer base that needs responsive, predictable performance….while at the same time juggling crews and equipment such that I am ensuring maximum capital utilization? When we are solving for one or the other optima, life is simple. I can simply get more resources than I need, have them sit idle and waiting for the work to pass through – in which case the work doesn’t get delayed. Or I can simply schedule the crews according to their optimal schedule – which may not respect commitments to my clients (the classic “cable man” or “appliance delivery” scenario). In IT, I have a limited number of testing resources. I need to run all of my projects through this testing bottleneck….hence I want to structure the project to reduce the time between design and release….but I also want to optimize the use of my testing resources. From a more macro IT portfolio sense, managers struggle with committing resources to projects before the projects actually can demonstrate a need for resources. In drilling, we have a limited number of rigs that must run from well to well performing drilling activities. Meanwhile, each well requires a series of activities to get ready for the rig arrival. Bringing the rig in too early simply means that it sits idle. Theory of Constraints provides us some guidance here, as in TOC, we would identify the bottlenecked resources, i.e. 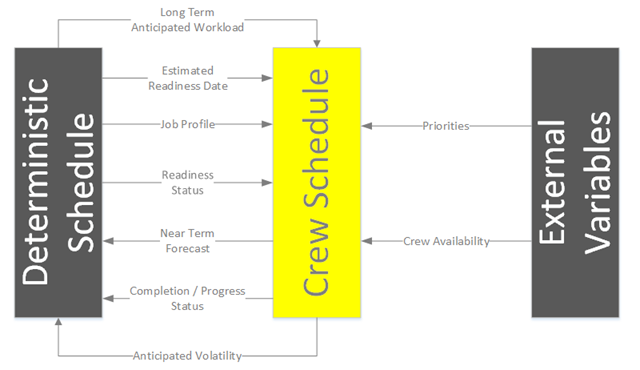 the crews, and then ensure that the deterministic scheduling approach creates a backlog of work in front of them, i.e. the bottlenecked resources are always utilized. As the readiness date approaches, the deterministic schedule dates may be adjusted based on real time field conditions. At a defined milestone, the readiness status is handed off to the construction team….who then slot the work into the schedule for the next planning period, i.e. 2 weeks or 1 month. We need to treat the construction date within our deterministic schedule as a target, but not a specific date on which work will be done. We need to identify a triggering task or condition prior to that date that indicates the work is ready to be scheduled within the construction scheduling queue. We need to have a separate scheduling queue for the constrained resource, i.e. a process to define when work is ready to enter the queue….and how that queue interacts with the overall logic of the deterministic scheduling model. We need a way of assessing readiness for the work to be put into the construction scheduling queue. If the work is not ready, we don’t want to waste everyone’s time scheduling construction. From a communication perspective, we need to ensure that the systems/groups communicate very specific data between each other. Using the model above, that would look something like this…and feel free to substitute any relevant constituency for “Crew” in this picture, i.e. drilling rigs, IT testing resources, etc. The key here is to recognize the respective value that both perspectives have on the fundamental problem, i.e. that we’re attempting to solve an equation for both speed and efficiency. Hence, we need to build a system (which includes people, process and technology) that can solve – and reconcile – for both.